High performance F5J model in modern GFK/CFK shell construction. The model is available in two versions (ARF/PNP) and in the PNP version largely pre-assembled. Due to the dynamic flight characteristics, the model is suitable for almost any application. Whether in weak thermals or strong winds, "SCIROCCO" always shows its good-natured and easily controllable side. The elaborate design enables excellent flight attitude recognition. The surface is plugged in force-locked and cleanly by means of CFRP square spar. 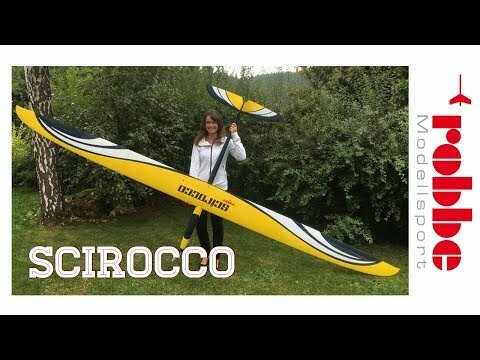 Das Produkt SCIROCCO 4,0 M ARF VOLL-GFK von ROBBE in der Kategorie Electric Glider Models hat eine Spannweite von 4000 mm sowie ein Gewicht von ca.3790g(Flugg.). Die Steuerung des Modells erfolgt über die Funktionen E,R,A,M,F. Das Modell ist als ARF - ALMOST READY TO FLY ausgeführt und ist für Fortgeschrittene geeignet. Die Fertigstellung des Modells ist für Modellbauer mit Vorkenntnissen einfach möglich. Wir empfehlen einen 4-5S/4000 LiXX Akku für dieses Elektroflugmodell.